...the outstanding press Jesse Salcedo has received. Copyright © 2010, Jesse Salcedo, All Rights Reserved. On a cool fall evening, my fiancée and I threw another log on a campfire, stared up at twinkling stars, and listened to the sound of a trickling stream a few feet away. All this took place inside our quarters for the night—a 20-foot-diameter tepee that architect Jim Dummit has nestled in his backyard in San Luis Obispo, California. In warmer months, Dummit uses the 20-year-old structure for dining and for guests. When winter comes, he simply rolls up the canvas shell and stows the 15 shaved-bark poles that from its skeletal frame. The word tepee, or tipi, comes from two Sioux words: ti, which means dwelling, and pi, which means portable. Nomadic tribes (such as the Sioux, Cheyenne, Blackfoot, and Crow) who lived on the Great Plains used them because they break down quickly and can be easily moved from location to location. Their tepees, which were dragged travois style, were made from buffalo hides and, later, from canvas. The design is sophisticated, with subtle, refined touches like wind flaps (a Cheyenne invention) that help draw smoke up and out, as well as interior liners that direct incoming air up the insides, stop ground-level drafts, and diffuse shadows. A prime example is the 160-year-old, 20-foot-diameter buffalo-hide tepee at the Plains Indian Museum of the Buffalo Bill Historical Center in Cody. Wyoming. The contemporary tepee shown at left was erected in about two hours. Its cover is 12-ounce flame-retardant, waterproof canvas stretched over hand-cut Douglas fir poles. A 20-foot-diameter model like this one, which has 314 square feet of interior space, costs about $2,500 with poles and liner. 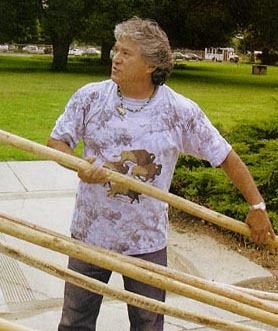 It's available from Jesse Salcedo, who imports and sells tepees that range in diameter from 7 to 24 feet. Last year he sold more than 50, which found use as playhouses, guesthouses, temporary storage, vacation homes on remote sites, wedding chapels, and honeymoon suites. A Woodside-based general contractor has created a fascinating side business reinventing the classic Native American residence—the tipi. Gentry reports. The Sioux word "ti" means dwelling and "pi" means portable, Woodside resident Jess Salcedo has gone back to his roots to form a booming little business recreating authentic tipis for use as guest quarters, artists' studios, and kids' retreats. 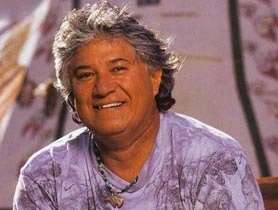 Born to an Apache mother from Colorado a net a Mexican father, Jesse Salcedo's life is ripe with culture. He grew up on a vineyard in Hollister, California. It was in Hollister that Salcedo honed his wood carving skills. Those skills started him on the journey toward being a craftsman and builder. Salcedo is very close to his large family. Family reunions can bring upwards of 200 immediate relatives together. With so much familial influence, it's not surprising that he loves to share his rich history with others. "I imagine that probably 75 percent of the American people have a little native blood in them and they should know more about the culture. If I encounter curiosity about my heritage, especially from kids, I love to feed that," he says. Salcedo loves to saturate himself in his history. In the early 1990s, Salcedo went to a First Cavalry Association reunion in Montana to meet his buddies who also served in the First Cavalry in Vietnam. "I hooked up with about 75 Crow Indians who served in Korea, Vietnam, and World War II. We did a seven-day wagon train in the Rosebud Mountains. On the last day, we went to Custer Battlefield and did a full-on charge. Seventy-five veterans on horses—it was very emotional and I came back home with three tipis as souvenirs of the event." He gave one of them to his cousin, who in turn set it up at his Los Angeles home where he received an overwhelming amount of interest. "People were leaving notes in my cousin's mailbox asking where he got it and where they could buy their own," says Salcedo. "He called me and told me I'd better put together a price sheet and a plan to make some tipis." Not that he had ever made a tipi in his life. But with his wood carving and contractor skills, he decided to give it a go. He did the research and discovered everything there was to know about the different varieties of tipis. He learned that Sioux tipis, for example, had large smoke flaps to allow for maximum airflow during the hot summers on the Great Plains while the Crow style had & smaller flap to keep the frigid winters out. "No matter where it's being used, a tipi's door should face east because the prevailing winds generally come from the west. You want the wind to pass over the top and draw the inside fire's smoke out like a chimney," notes Salcedo of the simple but smart design. 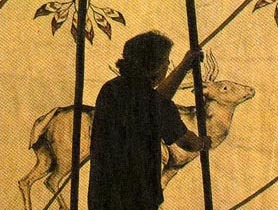 While antelope and buffalo hides were used to make a traditional tipi (typically 12 to 15 for a family-size dwelling), Salcedo decided to go with the more readily available and politically correct canvas, which was widely used by Native Americans after its introduction in the mid-1800s. The only difference between the older tipis and Salcedo's modern recreations is that his are flame retardant and water-resistant. Not that his clients mind the slight improvement on tradition. Those clients span the gamut of parents wanting to add some family fun to the backyard to bed and breakfast owners wishing to add a little spice to their accommodations to Native American cultural centers. 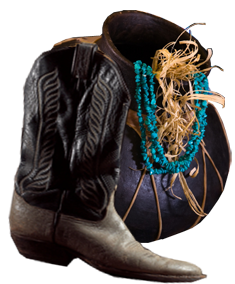 Salcedo's creations are available in sizes ranging from 7 to 24 feet in diameter and start at about $375. "If people want, we can install them, but I definitely recommend that customers feel comfortable setting them up on their own so they can take them camping and have a campfire inside. After all, that's what tipis were designed for." No matter how one uses a tipi—whether for backyard fun, ceremonies, educational devices, or shelter—Salcedo is happy to recreate a piece of history. A piece of his and his extensive family's history for the world to understand and appreciate. After three decades as a general contractor, Salcedo likes to say with a laugh, he's still in the shelter business. Only it's a bit of a stretch to call what he does now — selling custom-made tepees — a business. For Salcedo, 53, it is more of a calling of the heart, a passion and a joy that he is eager to share with others. He won't be pressed to hurry to fill a demanding customer's order; that robs his pursuit of pleasure. For Salcedo, whose ancestry is Apache and Mexican, selling tepees is about honoring his American Indian heritage and bringing customers closer to nature and, perhaps, to their childhood yearnings to sleep in a tepee. Behind Jesse Salcedo's gracious Woodside home, yards away from the sort of pool one dreams of on a summer afternoon, stands an incongruous sight. A large white tepee points grandly skyward, the aroma of burning sage in the air. Down from the house a bit, in a corner of this lovely acre-plus lot, Jesse Garcia, a friend who does some work for Salcedo, rhythmically strips the bark from sweet-smelling, straight-as-an-arrow young Douglas firs. The stacks of slender limbs are destined for tepees, as well. After three decades as a general contractor, Salcedo likes to say with a laugh, he's still in the shelter business. Only it's a bit of a stretch to call what he does now — selling custom-made tepees — a business. For Salcedo, 53, it is more of a calling of the heart, a passion and a joy that he is eager to share with others. "I'm trying to do this with grace and honor," says Salcedo, an irresistibly cheery man with a graying shoulder-length mane and sturdy build. "I don't want to exploit. It's important that I don't offend anybody, that they reaize it's not a traveling Wild West show. "It's not a money-maker. That's not the point, man." Of course, for all its iconic power as a symbol of native culture, the tepee can also be seen as something of a stereotype as well Salcedo's Apache ancestors, like many American Indian tribes, never slept in a tepee. Across the country, American Indians lived in dwellings as varied as their own cultures. But it was the tepees of nomadic Plains Indian tribes such as the Dakota (Sioux) that became emblematic of a way of life and captured the imagination of many a child. First made from animal skins and pulled on travois by dogs as the tribes moved, tepees later were larger and made of canvas, pulled by horses. The tepee captured Salcedo's imagination about five years ago when he saw them while attending a First Cavalry Association reunion of his military unit — "General Custer was the Seventh Cavalry," Salcedo says with his trademark grin — in Montana. Salcedo came back with three tepees and set them up for a family reunion. "The family just loved them," he says. Passersby noticed the tepee in his yard. Others noticed the poles lashed to his car when he was transporting the tepee. One thing led to another, and soon Salcedo was in the custom tepee business. Finding customers through area home and garden shows, where he erects impressive displays of bents outfitted with native and Western gear, and through word of mouth, Salcedo sells between 25 and 50 "authentic native tipis" a year. He prefers the spelling tipi, a combination of Dakota words for dwelling. 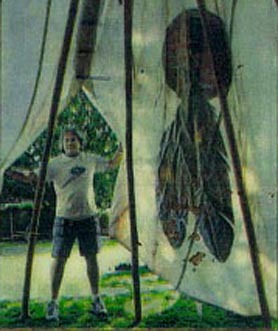 Salcedo's tepees include fire-resistant, water-resistant canvas, ropes, wood poles and a setup booklet. A liner, which helps control the climate inside the tent and provides more privacy, is additional. 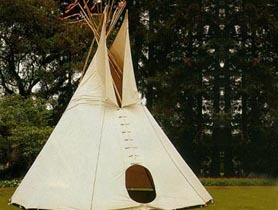 A typical tepee, with 16-foot diameter, would sell for just over $1,800 with a liner. Salcedo also delivers and installs the tepee for a fee, ranging from $75 to $450, depending on the size. His tepees range from a smallish 7-footer (about $400), in which he says five small children can sit comfortably, to a giant 24-footer with 452 square feet of space (more than $2,500 without a liner). And yes, as long as the tepee is at least 14 feet in diameter it's possible to have a fire inside a rock ring, Salcedo says. True to himself, Salcedo is a sort of general contractor when it comes to tepees, too. "It's not a money-maker. That's not the point man." 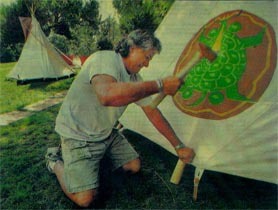 Until recently, he purchased the canvas from a Montana family that has been making tepee canvas for 45 years. Attempting to branch out and try new ideas, he says, "I've got an apprentice in Watsonville sewing." He wants to try hemp tepees and to experiment with colors. "You still want to be traditional, but you can't deny it's 2002," he says. His customers find many uses for the structures. They serve as children's playhouses, adult retreats — a Carmel artist keeps her easels in her tepee — guesthouses and even as honeymoon suites. Salcedo says he installed four tepees for a wedding party in Napa, including one tepee the customers had outfitted with a wood floor, clawfoot tub, pedestal sink and toilet. David Jaeger, a hotel furnishings manufacturer's representative who lives in Monte Sereno, keeps a queen-sized bed in the tepee on his Gold Country property. It's a popular guest retreat. "It makes you want to go out and look for arrowheads," Jaeger says. "It's environmentally friendly. It allows people to sleep outdoors instead of being in a pup tent." The Los Altos Hills Recreation Program uses one of Salcedo's tepees for its Ohlone camp, which teaches children about area wildlife and Ohlone culture, among other things. "We use the tepee because we cannot make an Ohlone shelter, which looks like a wigwam," Rebecca Hickman says. "We have it perched on the top of this beautiful hill underneath an oak tree. So many people have commented on this tepee. It looks great up there." For many customers, Salcedo says, just stepping into a tepee evokes a sort of elemental, spiritual response. It brings them in touch with either their own heritage or this country's heritage, he says. "I have blue-eyed, fair-skinned people stopping by at shows, and they're telling me, 'My grandmother is native,' " he says. It is, as he explains when asked why he doesn't have the tepees cheaply mass-produced out of the country, "an American thing." You can reach Jesse Salcedo at jdsalcedo@earthlink.net or at (650)369-0383. Special to the Chronicle There's a favored spot for peeling tepee poles on the sprawling grounds of Jesse Salcedo's Peninsula home. And there's another site, near the kiwi trellis and the grapevines cascading by a side fence, where he dries the poles for a minimum of 2 years. Lying flat and straight and bundled, the Douglas fir posts will form the framework for his custom tepees, a pursuit with occupational, personal identity and spiritual components. "It's more like a hobby - a cultural exchange - than anything else," says the general contractor, who has made several attempts at retirement. And like most hobbies, his tepee passion keeps taking up more space in his domestic environs, although he sells maybe two dozen a year and donates a few now and then. Any day now he'll get rid of his stepdaughter's first car, an "old tank Mercedes" hogging up room in the carport that leads to his wood shop. Near his deluxe barbecue unit, he stores the implements for his winter pastime of furniture making. This fiftysome son of an Apache mother and a father with Mexican roots is selective about the projects he undertakes these days in his contractor business. Currently he's remodeling a home in nearby Atherton. And in his tepee venture, the Woodside resident with more than 30 years of carpentry experience under his tool belt has a product that reflects his heritage as well as new possibilities. For Salcedo and his tepees know no boundaries. They can be found on the shores of Malibu, in the Sacramento Delta and at ceremonial observances of indigenous people. The American Indian Veterans Cultural Center in Menlo Park, at the Veterans Affairs hospital grounds, features a 16-foot-diameter tepee that is an anchor of the cultural center. It is open to the public and is used for prayer, meditation and counseling by community groups. The tepee shares the yard space-behind the hospital chapel with three sweat lodges and other American Indian mainstays. The sweat lodges have dirt floors topped with rough-hewn, igloolike mounds of willow branches fastened with twine at their center. The tepee issued by women's groups counselors or lone visitors who want to meditate during the day. Hopi tribe spiritual leader Elmo Hernandez points to a fire pit in the middle of the tepee's earthen floor that is used often for evening events. "We pray to the four corners before we start our ceremony - that's why the doors and fire pit face east - the creator gave us life in the east," he says. Outside, a cedar bench hand carved by Salcedo, who also makes furniture out of black walnut, is set beneath a tree. While counseling sessions are private, Hernandez says most other activities held in the tepee are open to the public and visitors are welcome at all times. In keeping with tradition, the tepee was blessed and sage was burned when it was installed two years ago. A staff outside, festooned with feathers and ribbon, serves as a flag and traditionally indicated that people lived there. Although tepees are not traditions of all American Indian bands, members of many tribes in these contemporary times adopt them for a myriad of uses. Salcedo erected a 16-foot tepee for Earthbound Farms children's garden in Carmel Valley, with a theme of celebratory horticulture painted on the outside. Butterflies and birds adorn the canvas and a gigantic kohlrabi cabbage emerges from the entrance, its greenery reaching upward toward the smoke flaps. Popular with school groups, it is also a magnet at Earth Day and harvest festival doings and last fall it was headquarters for ghost storytelling, with the tepee illuminated by mini jack-o'-lanterns as children sat inside listening to tales. Before designing and painting the garden motif, special events manager Janna Williams conducted research on tepee painting and learned the top of the structure represents the heaven, the bottom the Earth, and whatever is put in the middle is what the specialty is - for us it is vegetables and flowers. Salcedo's tepees - he favors the spelling "tipi" associated with tribes from the Great Plains - come with smoke flaps in the wide-lapel style adopted by the Sioux, which provided ample circulation during stuffy summer evenings on the prairie and with the small flaps favored by the Crow for protection against the blasts of harsh winters. The flame-retardant, water-resistant tepees range from 7 feet to 24 feet in diameter and cost from $299 to $1,806, not including the cost of poles, liner - and a setup fee if that service is requested. He also offers a birdhouse model, a mini canvass tepee that mirrors the design of its full-size counterparts. He recently introduced two hemp versions in 7-foot and 12-foot sizes. Salcedo describes the 10-ounce material as similar to Irish linen while the 'timeless' 15-ounce fabric resembles burlap. "I'm thinking of painting that one," he says of the heavier canvas. The coarse material, which Salcedo says is difficult to waterproof, should stand up the elements better with a coat of primer in earth tones and then the design. Salcedo also is studying solar energy methods that may work with his tepees. Based on Salcedo's pattern, an apprentice in Monterey County sews the 7-foot and 12-foot tepees, while his larger designs are made by a source in Montana. Occasionally Salcedo assigns an artist to paint figures on the fabric, such as bears or feathers. Salcedo handles all other aspects of the enterprise, from marketing to installation. Hand-carved furniture pieces that accent his tepee exhibits at home and garden shows and other events call to mind a native village. But leave it to clients to come up with creative touches of their own. Salcedo tells of an artist on the Monterey Peninsula whose tepee, which she uses as a painting studio, opens to let in the sunlight as it welcomes the new day. There's a trio of easels, all of them different projects she works on 'depending on her mood." On the interior canvas of the tepee she dabbed blotches of paint as a test sun "and then went ahead and did it on the painting on an easel." And while Salcedo's tepees have been tapped for duty at a Malibu High School fund-raiser along the Pacific Coast Highway, as a honey-moon suite in the Wine Country, guest quarters and party venues, they still make the cut as a primary residence. There's a family in the Sacramento Delta interested in ordering multiple units in different sizes that they will inhabit while their home is being built. One 16-foot tepee is earmarked for the washer/dryer, the toilet and a pedestal wash basin. Another tepee of the same size will house the television and sitting area and other tepees will serve as sleeping quarters. Salcedo's own relatives inspired him to start his business six years ago after he installed three tepees for a family gathering. It didn't take much coaxing for Salcedo to ease into his new endeavor. He grew up among the San Benito County vineyards and now lives in a rural enclave of Woodside, never straying far from nature or his ethnic roots. But this master craftsman with salt-and-pepper wavy locks can't be accused of being caught in a time warp. As he prepares to drive off for an evening meeting in a neighboring county, he tucks his Palm Pilot in a picket, shifts a cellular telephone and a laptop under an arm and boards his luxury sport utility vehicle. There's lots of ground to cover in this tepee business, and the ever-ready Salcedo uses many tools.